I've finally finished editing the movie of our trip away. Finding the time to do these things is hard, especially when there are work pressures combined with sleep deprivation and a child that thinks 9pm is a reasonable hour to hit the hay (only to take another 30-60 minutes to actually fall asleep and in the process making his Mummy come in and out of the room to reassure him she is just outside the door). So the only time I actually have for "me" time is between 10pm and whenever I decide is a reasonable hour to get to bed and still be able to function the following that day. When I first started making movies a year ago I had not anticipated that my son would love them so much, and so soon. I had hoped he would be interested in them when he was older, but it turns out he is a narcissist by nature and loves seeing himself in motion. He has already seen this latest movie perhaps a dozen times this morning - over and over. He usually asks for "watch Kien" and then "more Kien" but today it was "more Ethan". It's funny how he sub-names the movies. He calls the Xmas one "Jingle Bells" or "Thomas", and he calls the zoo one "Away", or the beach one with all his little friends "Catch". The rest of them fall under the generalised bucket of "Kien" movies. 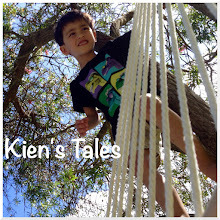 I like that "watch Kien" rates the same as "watch heli hey-tee-tas" or "watch diggers", and he gets just as excited with turning on the TV or iPad or iPhone to watch any one of them. So without further ado herewith the movie - L.A. 2012. Hey, if you are receiving this post as an e-mail you will not see the movie I've just embedded above. So you need to come to the actual blog post online, or if all else fails, here is the link to it on youtube. Oh that is stunning! I love making video clips like that. Mine isn't as good as yours though. I've made 3 so far. The latest one for a friend! And I'm especially proud of this one http://www.youtube.com/watch?v=8TWWoUDhdt4 which is a song specially written for me based on one of my poems. This is a follow up from one titled "Bianca's Story". This is the one I made for a friend - http://www.youtube.com/watch?v=nJyerlMQQng.